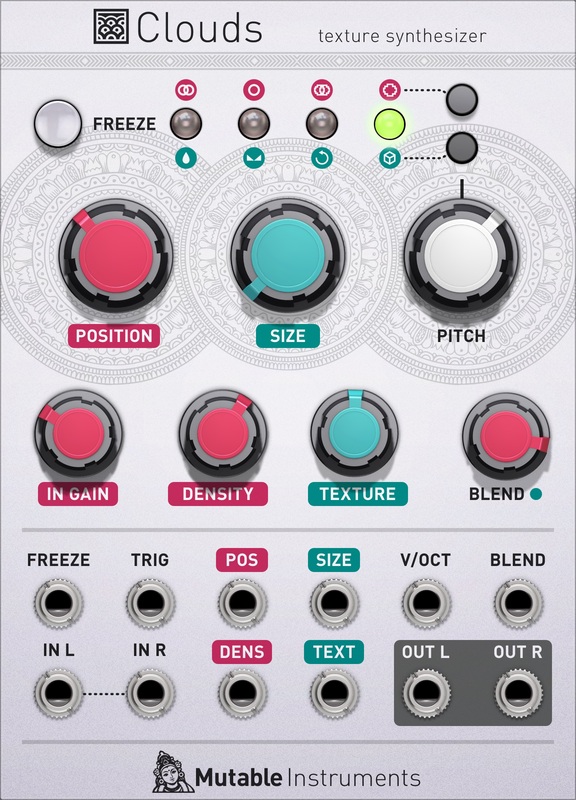 Mutable Instruments have been making Eurorack modules in that latter category for almost a decade, and now Clouds — the texturizing module which sold like crazy in hardware and be- came a firm favourite of enthusiasts around the world — is available for Modular. A digital module, Clouds hides hidden depths behind its every control, and learning its limits and possibilities is an adventure in itself. It’s great for mangling incoming drum loops into trippy, jerking breakouts. It can be used as a kind of one-shot sampler by freezing the buffer, allowing users to play with the same chunk of audio indefinitely. It can robotize an input signal, by using an external oscillator to quickly freeze and un- freeze the audio stream. It can be used like a wavetable by populating the buffer with multiple different tones. It can even simply add some grit and texture to a signal by generating a granular, irregular delay tail and blending it in parallel with the audio stream passing through. A kind of organic sonic friction. It’s a reverb, a delay, a stereo-spreader, a pitch-shifter, a sort of time-stretcher, an ab- solute ton of fun, and much more.